Have you been introduced to Quinoa yet? Most people view this grain as exotic and expensive (which it is). 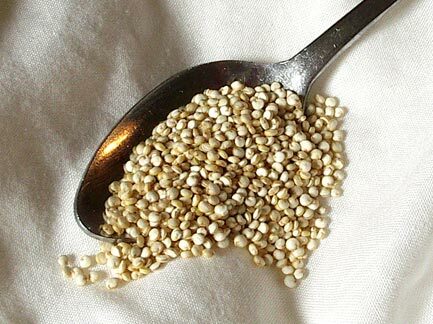 However, Quinoa, at 5 grams of fiber and 8 grams of protein per serving, is worth the investment. Quinoa is cooked just like rice - in fact, I cook it in my rice cooker. You use the same ratio of grain to water (1 cup grain to 2 cups water) as you use for white rice. It can be used just like rice, as well. It can be used to make a salad (my favorite recipe is Ali Vincent's Mango Quinoa Salad) or add a few herbs and spices to make a delicious and different side dish. This morning, I even ate it for breakfast. I added some salt, brown sugar, cinnamon, walnuts, and mini chocolate chips and it tasted delicious! I hope you will give this grain a try. We don't need to be afraid to try something new. After all, you never know until you try it! I put this on Frugally Sustainable's Blog Hop Today. Check it out for lots of great ideas! Thanks for a post that got me going again! Will have to try this! Thanks for sharing! I use quinoa instead of rice in our favorite rice pudding recipe. It makes for a delicious & filling breakfast. I think we eat quinoa more at breakfast than at other meals! What a great idea - using quinoa instead of rice in rice pudding! I am definitely going to try it. Thank you!